With summer just a week away, I've been making a list of healthy and filling salads I can make ahead on weekends and keep in the fridge for easy lunches all week long. Not just plain old lettuce type salads, though. I needed something heartier that would hold up over a few days and be satisfying. The easiest way to boost the heartiness factor is to add grains and I realized that my jar of quinoa has been sadly neglected lately. Quinoa it is. As for the veggies, I wanted options that wouldn't get soggy and provide lots of crunch. And a little boost of nuts or seeds thrown on just before serving really brings it all together. Adding regular lettuce wouldn't hold up very well over time but baby spinach leaves do and were a surprisingly wonderful pairing with the tahini dressing. To me, the mark of a great recipe is one that I want to make again immediately after I've finished eating it. And this salad has been on perpetual re-make for the last couple of weeks. Enjoy! Add the quinoa and water to a pot and bring to a boil, cover, lower the heat and cook for 12 minutes. Turn off the heat but keep the lid on for an additional 5 minutes. Prepare the vinaigrette by combining the olive oil, tahini sauce, lemon juice, mayonnaise and garlic in a bowl and whisking together. Season to taste with salt and pepper. 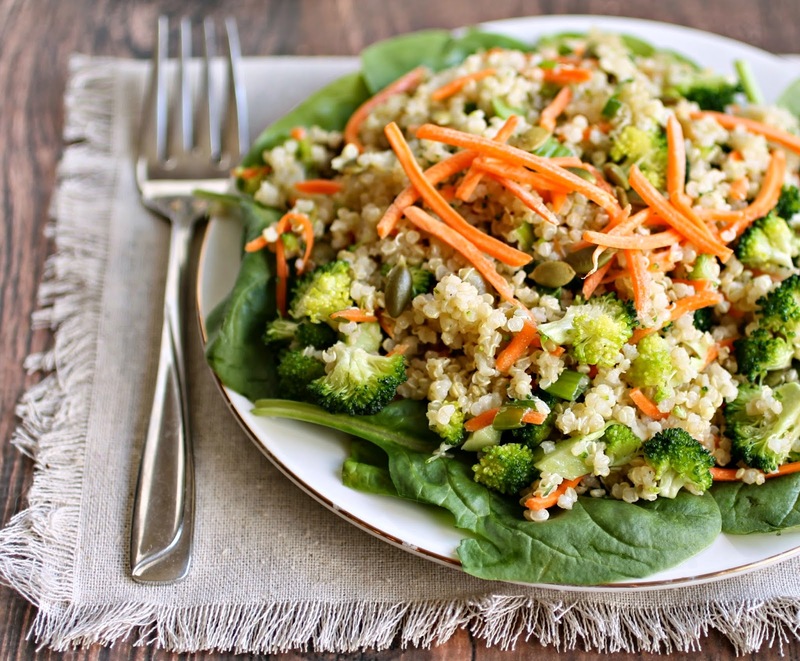 Add the carrots, broccoli and scallions to the cooked quinoa. Pour on the vinaigrette and toss to combine. Fold in the spinach leaves and finish with the sunflower seeds. This salad may be served warm or at room temperature. Makes 4 side dish servings or 2 meal sized servings. A salad I could eat for days. Bring it on!!! I've become a huge fan of quinoa over the past few months. 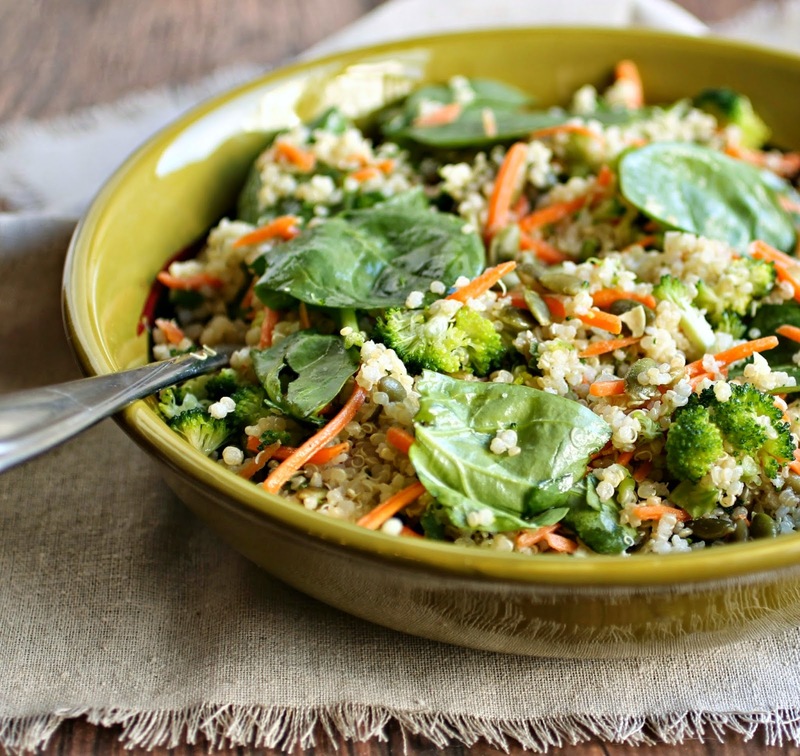 Love the tahini in this salad! Such a healthy, guilt-free eating.. Love the colors. 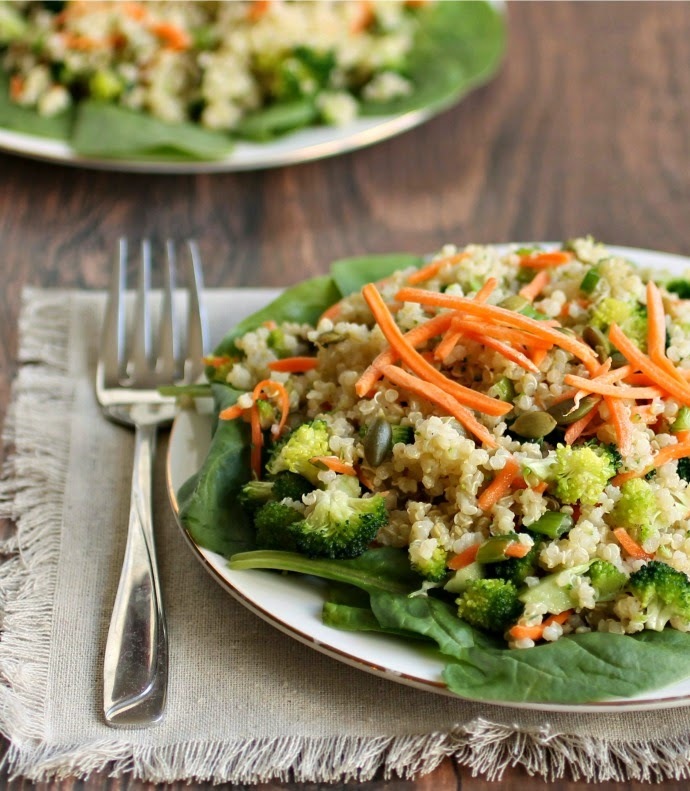 Yum...I love quinoa and I love tahini! Great post Anita! Pinning this!